BUCKEYE™ Nutrition. Your Passion. Our Purpose. How Does Breed, Diet & Obesity Affect Insulin Sensitivity? Insulin dysregulation and obesity can increase the risk of horses and ponies developing pasture-associated laminitis, but this can also occur in non-obese animals. 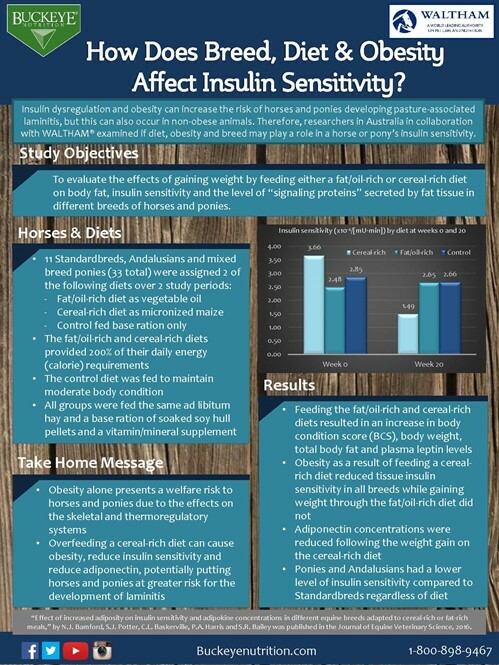 Therefore, researchers in Australia in collaboration with WALTHAM® examined if diet, obesity and breed may play a role in a horse or pony’s insulin sensitivity. Read more on this exciting research that was recently awarded as the 2017 “Most Commendable Paper in an International Journal” by the Australian and New Zealand College of Veterinary Scientists (ANZCVS)!